For those looking for new business venture or opportunities, Top Thai Brands showcase is coming this 9th to 12th August 2018 at the Kuala Lumpur Convention Centre (Hall 5). Themed “Open Up New Business Opportunity With Thai Creativity”, the event shines the spotlight on Thai ingenuity and entrepreneurship. The four-day extravaganza will feature the most fascinating Thai products and services, alongside an interesting mix of activities. 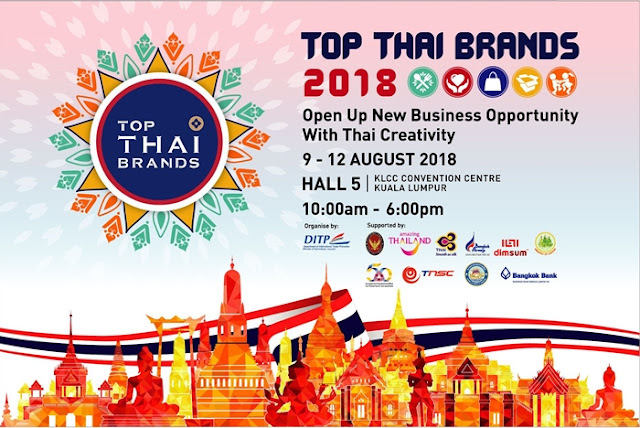 Top Thai Brands 2018 is organized by Thai Commerce Ministry’s Department of International Trade Promotion (DITP), it offers a dynamic platform for the Malaysian business community to explore opportunities and partnerships with Thai companies. Additionally, it aims to provide assistance to Malaysian importers and distributors in promoting Thai products and strengthening their market positioning. Exhibitors represent a wide range of sectors, including Halal F&B, spa, beauty and wellness, packaging and machines, household products and home decor, fashion and accessories, kids’ clothing and toys, pet products and much more. Top Thai Brands 2018 is a must-visit for traders, importers, distributors, wholesalers, retailers, and sale representative or agents who are seeking new innovative products. It will also benefit those involved in food and hospitality services such as catering businesses, restaurants and hotels (HORECA), as well as café and shop owners. Also not to be missed is the “Leveraging Trade and Investment Opportunity with Thailand” seminar on 10 August 2018, supported by the Royal Thai Embassy. Get insights on how to capitalize on Thailand’s strengths in product and service creativity, investment incentives as well as financial tools. Speakers are from Bangkok Bank Berhad, Boat Noodles, Thai Odyssey, Tan Chong Group, Karex and Board of Investment of Thailand.